Hammer of the Scots is a game by Tom Dalgliesh and Jerry Taylor, published by Columbia Games. It is for 2 players. 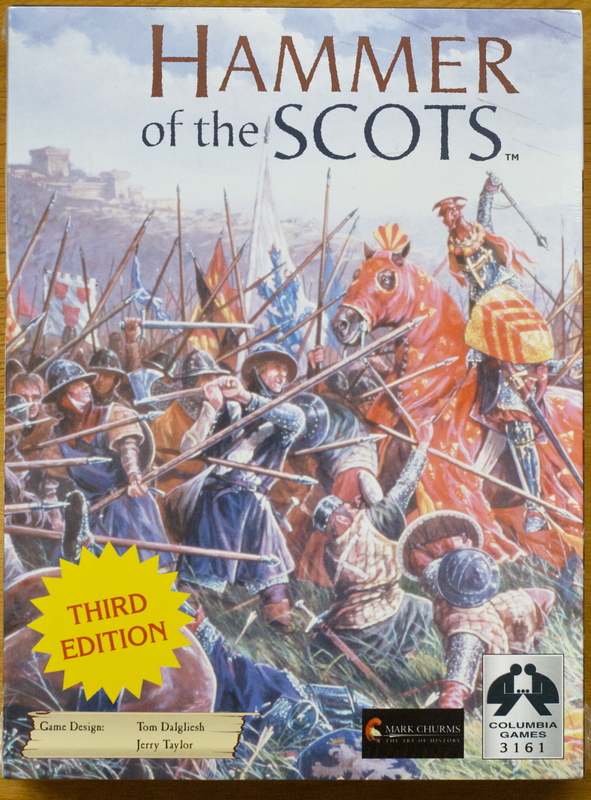 In this game, players will be controlling the forces of the Scots and the English. They will be trying to control a majority of nobles before the end of the game. There are 2 scenarios and a campaign mode included with the game. If a player controls all the nobles in play and can eliminate either the Scottish King or Edward III, depending on which side they’re playing, they will be declared the winner. To begin, each player chooses a side. The English player takes the red blocks and the Scottish player takes the blue ones. The map is placed between the players. Players then choose one of the scenarios or can play the campaign mode. Both players deploy their starting units on the map as determined by the scenario rules. All the cards are shuffled and placed face down in a stack. Play now begins. The game is played over a series of years as determined by the scenario rules. Each year of play has 1-5 game turns, those turns have three phases each. The phases are played in order. They are the Card Phase, Move Phase and Battle Phase. To begin a new year, each player is dealt 5 cards. In the card phase, both players play a card face down. The cards are then revealed and the higher card’s player is the first player. The cards are either move cards that allow the player to move their units or are event cards that give special actions as noted on the card itself. The next phase is the move phase. In this phase each player uses any move cards that they played in the previous phase to move some or all of their units. They can also choose to do nothing, if so desired. Units can be moved in groups or singly during the movement phase. They must follow border limits as well as group movement rules. Once the first player has made all of their movements, the other player can then move their units. The next phase is the battle phase. When enemy units are located in the same area, battles occur. These are resolved in a one by one basis. Battles are fought over a maximum of 3 rounds. Afterwards any attackers left must retreat if there are any defenders left. In combat, units may fire, retreat or pass depending on the combat rating. Units battle in alphabetical order. Combat is then resolved by rolling dice equal to the units current strength. Any rolls equal to or lower than the opposing units combat rating scores a hit. Hits are applied to the strongest enemy unit. Once the battle is over, the winner may regroup to any adjacent friendly or neutral area. If a noble is eliminated in combat it is immediately switched over to the enemy’s side at a strength of 1 and placed in that player’s reserve. The game year ends if both players play an event card at the same time or once all 5 cards have been played. Once the year ends, the special Winter turn occurs. The Winter Turn is when some units can disband and players then prepare for the next year. It’s used to move units to their winter quarters. Once the Winter Turn is over, the year advances. Players receive Replacement Points for any friendly areas equal to it’s castle limit. Players can draw units from their pool or even build a step onto an existing unit. All the cards are then reshuffled and placed back in the deck. A new hands of 5 cards is then dealt to each player and a new year begins. Once a player controls all the nobles in play at the end of a game turn and either the Scottish King or Edward III is eliminated in battle, the game is over. The player who eliminated the ruler is the winner. Alternatively if no winner has been decided before the end of the last year of play, the player with the majority of nobles at the end of the chosen scenario is the winner. There are lots of great pieces to this game. There are lots of really brightly colored wooden blocks. Each block represents one of your units. There’s a sheet of stickers that must be applied to the blocks before you can play the game. This takes a little bit of time but I rather enjoy it. The artwork for the units is comprised mostly of family crests and shields. It’s very much historically accurate. The maps are made of thin cardboard but they lay flat on the table so there are no problems with your units sliding off. I wish that the maps were thicker but it’s really not that big of a deal as the artwork for the maps looks really great. The dice are your basic standard issue dice. They look and roll just like dice. The cards are really pretty. The artwork is that of some beautiful renaissance paintings. I love how great that the cards look. They are really sturdy and are shuffled very easily. All in all, I really like what’s included with this game and think you get some great components here. The rulebook for this game is really nice. It’s put together really well. It has a lot of historical information all along the right side of the book detailing the history of the war. There are a few pictures scattered throughout the rulebook. Everything is really easy to read and understand. There are examples of the blocks with how to read them. There’s quite a bit of stuff to read but it’s not really that daunting a task as it’s all been laid out really well. If you’re familiar with these types of games, this will be a cinch to read over and learn. If not, it’s still relatively simple. I really like that you can either go with one of the two scenarios or can play an actual campaign. Each one is a little bit different. There are even rules for tournament play included. All in all, it’s done really well. I really like this game a lot. The block mechanic is something that I really enjoy. It’s really simple to learn and play. Like many war games it looks a little bit intimidating at first but isn’t really that difficult at all. It has a lot of historic references in the game. It has a long play time but it keeps you involved throughout the game. It’s very thematic playing through the different scenarios. The historic conflict plays out quite well in this game. It’s definitely a game worth playing. I really like it a lot. After playing it, you might find yourself with a desire to watch Braveheart. I did. For more information about this and other great games, please check out Columbia Games at their site. This entry was posted in Reviews and tagged board, board games, card, card games, columbia, columbia games, dalgliesh, games, hammer, hammer of the scots, jerry, jerry taylor, scots, taylor, tom, tom dalgliesh. Bookmark the permalink.